Dispel the Daedric influence in the woods of Shattered Grove. I discovered a statue outside the small town of Shattered Grove. The statue is remarkably lifelike and warm to the touch. Take a bear to Merormo's Tower. When approaching Shattered Grove, you may notice that the animals have an unusual red glow around them. 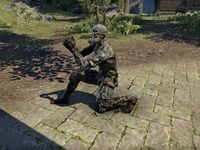 You will also find three statues - Halino, Lamolime, and Ocanim. Interacting with the statues will reveal that they are eerily lifelike and warm to the touch. 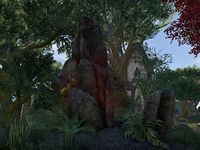 Head to Shattered Grove and talk to Merormo, who reveals that he turned the villagers to stone to protect them from the animals, who he believes to have become possessed by daedra. He thinks that the daedric influence has something to do with the monoliths in the woods and wants you to dispel them. There are four monoliths in total. They glow red until you dispel them. After you dispel them, Merormo will appear and tell you that dispelling the monoliths didn't work. He now wants you to enthrall a bear and take it to him at his tower so he can extract the daedric energy from it. His tower is near the southwestern monolith, and there are many bears in the area. Once you weaken a bear, use the binding gem on it and go to Merormo's tower. Once you enter, Merormo will attempt to banish the Daedra. Instead, the bear will burst into flames, turn into a flame atronach corpse, and disappear. Talk to Merormo again, who will inform you that something had interfered with his banishing of the Flame Atronach. He says that there is a powerful Daedra nearby and you have to kill it. Something must have happened to this poor villager. Perhaps I can find out more in town? The village is filled with statues and a very distracted mage. Perhaps he knows what happened to these people? I should speak with him. Merormo told me that he turned the villagers to stone. His goal was to protect them from Daedra. He's instructed me to dispel the energies around monoliths in the woods. That should clear the Daedric influence from the area. He hopes. Merormo teleported to me once I finished with the monoliths. I should speak to him. Merormo needs a bear to act as a test subject. The Binding Gem he gave me should allow me to befriend one of the posessed [sic] creatures. I captured a bear. Merormo instructed me to take the bear to his tower in the grove. I brought the bear to Merormo's tower. I should observe as he does his spell. Finishes quest Something went wrong with the banishing spell and a Flame Atronoch was released from the bear. I should speak to Merormo.